Yapahuwa is a city that elegantly perched on the Kurunegala - Anuradhapura road in the state of Wayamba. There are many cities in Sri Lanka who are most eminent and recognized for the embellishments they hold within their territory. However, Yapahuwa is not that eminent among visitors, that is the reason tourists tend to overlook the place more often. The place is not known to many but the elegance that remains from the past is still relevant to the locals there. But this fact doesn’t serve as its drawback but a boon for it. There is an unexplored touch that makes it all the more special apart from the remarkable ancient ruins present. 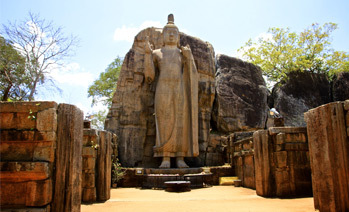 The Rock Fortress Complex of Yapahuwa stands as the most striking ruins of Sri Lanka and this has even gained it the title of the best archaeological site in the country. 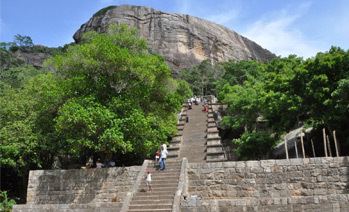 There are people who consider the place more significant than The Rock Fortress in Sigiriya. The rock fortress, that Yapahuwa has, comprises an enigmatic granite rock that has a spectacularly formed stupa head. Stupa head sits perfect at the top imitating the head of the Buddha. A Bodhi tree and a rock cave present there have been relevant evidences to prove that it served as a shelter to Buddhist monks. Besides this there are other caves as well that can be explored at the foot of this giant rock. All of the caves have their own significance, like one cave comprises some intriguing inscriptions on it whereas other supposedly served as a Buddhist shrine. Padeniya Raja Mahavihara: It is a temple which dates back into the medieval era and comprises some elegant adornments which makes it a desirable place to visit. The temple showcases some intricately carved pillars with a magnificently chiseled entryway. This grand entrance to the main shrine is supposedly the largest elaborated door present in Sri Lanka. Aukana Buddha: This is a sculpted image of Lord Buddha that stands around 12 m tall. Aukana Buddha, is said to be, standing elegantly since 5th century and since then this figure of Buddha is ‘eating-sun’ every morning. Aukana is the term given to the thought of sun-eating as the sun rays comes over this figure of Buddha then it seems that the sun has been eaten by Buddha every morning. As the name suggests early morning at the sun rise is preferred to be the best time to experience this wonder. How to Reach Yapahuwa: Yapahuwa is 5kms from Maho railway station and is Sited 112 km away from Colombo so it is considered better to travel either A28 main motor road or railways. Best time to visit Yapahuwa: Yapahuwa expect and welcome its visitors throughout the year. Festivals in Yapahuwa: Sri Lankan New Year is held in April every year. It is a non-religious festival celebrated by every bit of the population. As it is a non religious festival, the celebration doesn’t include rituals or customs rather it includes some traditional games and fun activities like pillow-fighting, ‘hide the wig’.